In his debut feature Monsters (2010), director Gareth Edwards focused on an unlikely romance in a world overrun by strange behemoths. A technical triumph of low-budget filmmaking, the movie won fans by focusing more on intimate human drama than the spectacle of urban destruction. Much like Bong Joon-ho’s The Host just a few years prior, it was a breath of fresh air in a genre typically shackled by repetition and formula. But that formula represents sustenance to the legions of loyal G-fans who still remember that Godzilla’s first romp through Tokyo was more catastrophic than campy, and by making the big lizard a peripheral player in his eagerly anticipated update (this Godzilla would have been better titled Soldier), Edwards ultimately fails to do justice to the monster’s legacy. As the story opens in Japan, we find dedicated nuclear-power-plant manager Joe Brody (Bryan Cranston) so caught up in his work that he forgets it’s his birthday. Sending his young son Ford off to school before reporting to the plant with his wife Sandra (Juliette Binoche), who works in the reactor, Joe begins to suspect that suspicious seismic activity may be something more sinister than shifting tectonic plates. He’s right, too: When the plant goes into meltdown mode and Sandra gets caught on the wrong side of the containment door, a massive cover-up ensues. Fifteen years later, Ford (Aaron Taylor-Johnson) has become a bomb-disposal expert in the U.S. military. He’s just returned home to his wife Elle (Elizabeth Olsen) and their son Sam (Carson Bolde) when he gets word that Joe has been arrested. Long estranged from his father, whom he wrote off as a conspiracy nut for his failed efforts to prove that the Japanese government is hiding something related to the disaster, Ford nevertheless ventures to Japan to get him out of jail and agrees to join him on a trip to their old home in the quarantined zone. Subsequently taken into custody, the pair end up in the very plant where Joe used to work, and where scientists Dr. Ichiro Serizawa (Ken Watanabe) and Vivienne Graham (Sally Hawkins) are studying a massive cocoon-like structure that appears to feed on radiation. The situation turns critical when the events of the present begin to mirror the past, and a terrifying winged creature dubbed a “MUTO” is unleashed. Meanwhile, as the military attempt to devise a plan to destroy the beast, evidence suggests that it had been calling out to something before it broke free. It turns out that the MUTO has awoken a towering, godlike leviathan that has lain dormant for centuries, and the latter creature may be mankind’s only hope for restoring the balance of nature. With Cranston in the lead early on, Edwards’ Godzilla starts out promisingly enough; though the characters are vaguely drawn, a foreboding sense of tension dominates the proceedings, and the Breaking Bad veteran makes a reluctant sacrifice that’s believably wrenching. Sadly, the action then jumps forward in time as the character of Ford steps into the lead, and Taylor-Johnson just doesn’t have the chops to make the drama resonate. Likewise, novice screenwriter Max Borenstein shows precious little inspiration when it comes to character and story development, lazily defining everyone in the film by their occupation (monsters included) and falling back on the creature-feature cliché of separating a family amidst the chaos. Perhaps if the characters actually said or did anything interesting here (a disappearing act worthy of David Copperfield in the case of Dr. Serizawa and Graham doesn’t count) Borenstein could be forgiven for the story’s shortcomings, but when the action cuts away from the monster mayhem the very first time Godzilla clashes with a MUTO, it’s apparent that neither the writer nor the director have much regard for the fans or the legacy of this series. In fact, from his place behind the camera, Edwards seems to take sadistic pleasure in obscuring his creatures for much of the film’s running time. While high-brow viewers will no doubt commend him for this uniquely restrained approach, the sad truth is that it just doesn’t make for a particularly exciting night at the cinema, especially given the flat characters and performances that dominate the movie’s deadly middle section (much of which, including a bit with a lost kid, could easily have been excised). Even the cautionary commentary about the dangers of nuclear weapons is bungled by Borenstein, who predictably uses the military’s controversial plan to nuke the creatures as an excuse to create a race-against-the-clock scenario precisely when the film needs it least. Once the earth starts to shake in the final battle, Edwards does offer some perspectives that are downright thrilling—particularly in the case of the much publicized skydiving sequence—but it’s too little too late, and an abrupt ending unintentionally reveals his desire to wrap things up as soon as the human drama has been resolved. 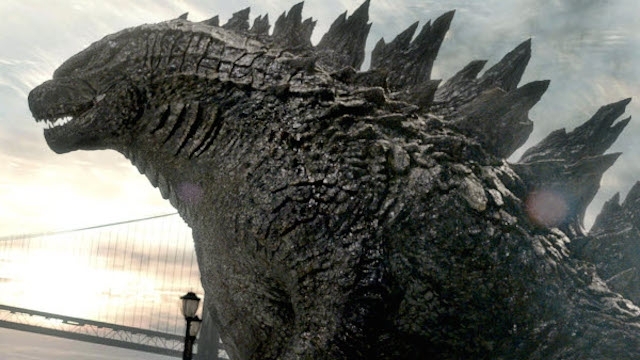 Odds are that you’ll want to clock out long before then, and unfortunately if you do, you’ll miss the shots of Godzilla in action that you paid good money to see.